Assam Police Recruitment 2018 Constable Posts 145 Nos. Assam Police Recruitment 2018 notification for filling up Constables jobs from SPOs (Special Police Officers) against sanctioned posts of Assam Industrial Security Force (AISF) Battalions under DGCD & CGHG, Assam. In continuation to this office advertisement dated 13.12.2017 for Recruitment rallies for filling up of 145 posts of Constables in Assam Industrial Security Force from SPOs (Special Police Officers) those who worked in Dhubri and BTAD during 2012 ethnic problem and the SPOs who were deployed in the districts of Bongaigaon, Chirang, Baksa and N.C. Hills for National Highways arid Railways line security during militancy. militancy in N.C. Hills, are invited with effect from 01.02.2018 to 07-02-2018. Qualification: Candidates should have passed Class VIII from a recognized School/ Institution. Age: 18 to 40 years as on 01-07-2017 (i.e., the candidate must be born on or before 01-07-1999 and after 01-07-1977). Upper age limit will be relaxed by 5 years in respect of candidates belonging to SC, ST(P) and ST(H) candidates. Qualified candidates will be selected based on Physical Standard Test (PST)/ Physical Efficiency Test (PET), written test. The candidates must personally come & submit paper application in the office of the Chairman, State Level Police Recruitment Board, Assam, Rehabari, Guwahati. Assam Police Admit Card Download 2018. NOTE: No application submitted through postal service/ courier service and other daks shall be entertained. The candidate must personally come in this office on the dates given above. The other terms & conditions mentioned in official advertisement dated 13-12-2017 will remain unchanged. It is mandatory for the candidates to mention a valid email address and individual mobile phone number in the application form as the same will be required to inform the applicant regarding the status of their application and convey other related information. 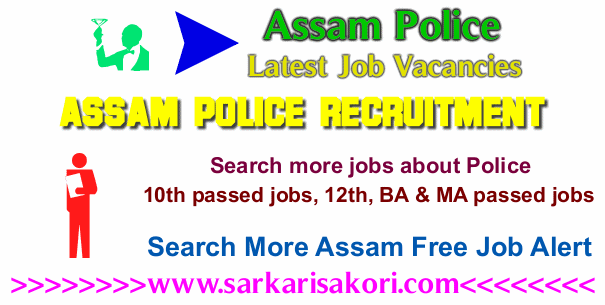 You will be interested more jobs about Assam Police Recruitment 2018.